Having spent so many Christmases away from home, I should no longer be vulnerable to fits of nostalgia by now. But, alas, I just cannot help but miss home whenever Christmas comes. I am a sentimental kind of guy and my sappiness just gets multiplied a thousandfold during the holidays. I must say though that I am not as homesick as I was twelve years ago when shortly after a quick quarter in school I packed my bags and rushed back to Manila to spend Christmas break with my family. Things have improved — greatly improved, in fact. But as soon as the Indian summer starts to fade and the leaves start to fall, I start to reminisce about Christmases past. Freshly roasted chestnuts in brown paper bags. 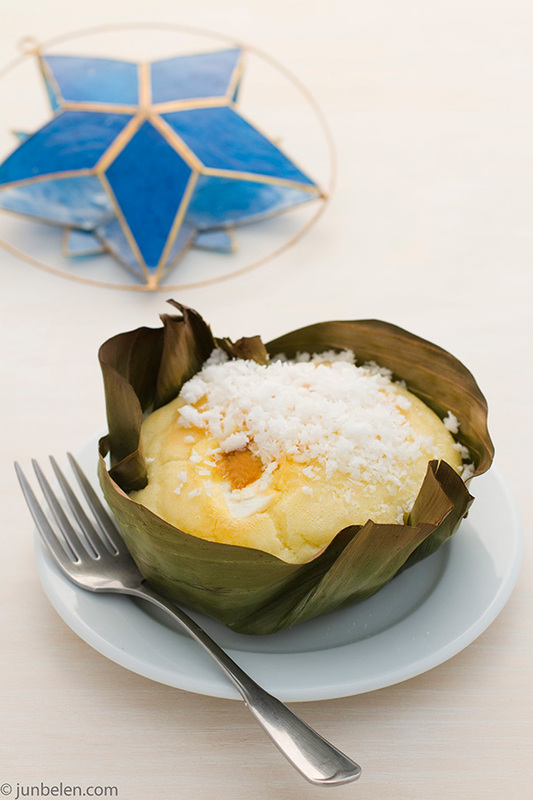 Bibingka nestled in banana leaves. Fruit cakes wrapped in crackling cellophane. Jamón and queso de bola. Piping hot chocolate. All these deliciousness in the middle of all the craziness of shopping and exchanging presents. My connection with my family has sadly changed through the years. It has been reduced to weekly twenty-minute phone calls with my mom and two-week visits every other year. Folks get older. Kids grow up. Birthdays, weddings, anniversaries, and milestones get celebrated. Years fly by. I know fully well that I signed up for this when I decided to live thousands of miles away but I always get reminded by this sad fact during the holidays. I have my own life now. My own family. But wouldn’t it be great if I could share it with my family beyond hurried phone calls or crammed visits? Wouldn’t it be great if I could enjoy the holidays with my family without the pressure of lost connections and mounted expectations? Yes, it would be great, indeed. But would it be ever possible? I don’t mean to be overly sentimental. I blame it on the rain and on the bibingka baking in the oven. 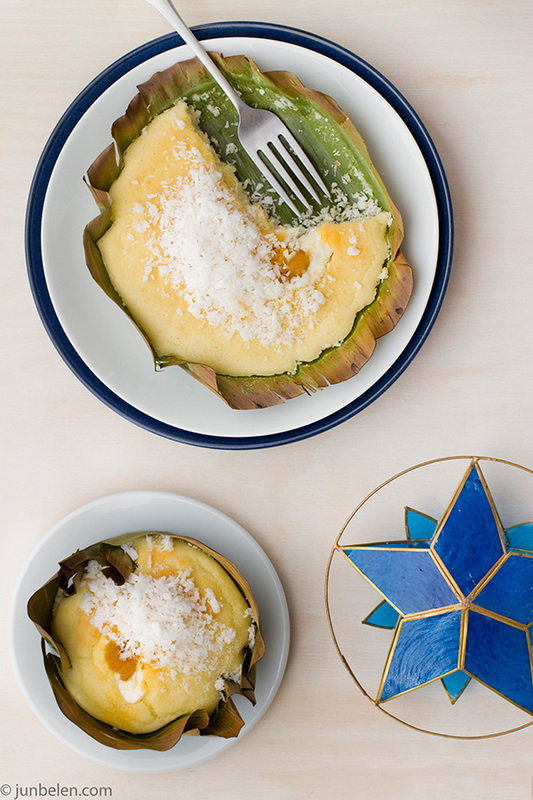 When I think of Christmas I think of the beloved bibingka — rice cakes in banana leaves baked traditionally in clay ovens over and under hot coals. The cakes are moist and mildly sweet and the sliced salted eggs on top and the grated coconut with sugar give them a distinctly delightful flavor and texture. 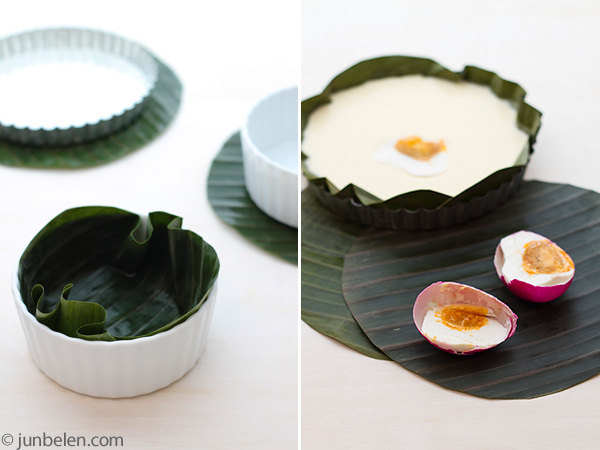 In this recipe, I use tart pans and ramekins lined with banana leaves. From the rice flour to the salted eggs, all the ingredients for these gluten-free rice cakes are readily available in most Asian grocery stores. Line four tart pans or ramekins with banana leaves. Beat eggs in a bowl. 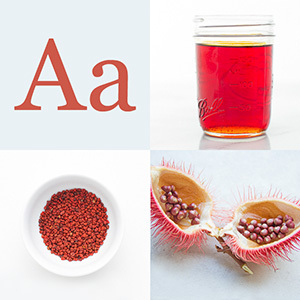 Add sugar and beat well. Add butter. Alternate adding flour and coconut milk. Beat until just blended. Do not overbeat the batter. Divide the batter equally into the four pans. Lay slices of salted egg on top and set the cakes on the top rack of the oven. Bake until the cake is cooked through, 20 to 25 minutes. Turn the broiler to low and broil the cakes to brown the top for about a few minutes. Watch cakes carefully to keep them from burning. Thanks Jun for sharing your Rice cake recipe and more power. I made this today and was wondering if the consistency of the cake is supposed to really end up like that of a cassava cake. If so, do you think eliminitang the glutinous flour will make it end up like cake bread. Did I do something wrong? First of all, thank you for trying out the recipe. Maybe the cake wasn’t done yet? Did you test the center with a toothpick? Did it come out dry? Also maybe you overbeat the batter? It’s okay that the batter turns out lumpy and not smooth, as long as the ingredients are just blended. The reason I add a little glutinous or sticky rice flour is to make the cake a little tacky or chewy but not too much that it becomes too dense and moist like cassava cake. You’re welcome, Ron! I hope you’ll try it soon. OMG you’re making me hungry! I want bibingka too! I’m so glad you enjoyed the bibingka recipe. I know, that broiler is hot! And it burned my cakes, too, at one point because I wasn’t paying attention. Happy New Year, Nina! !